Today's nail color is China Glaze Westside Warrior, from the Metro Collection. Since I've been really busy with work and school, this collection just about passed me by without me taking notice. Once I saw in person though, I couldn't help but really want it. 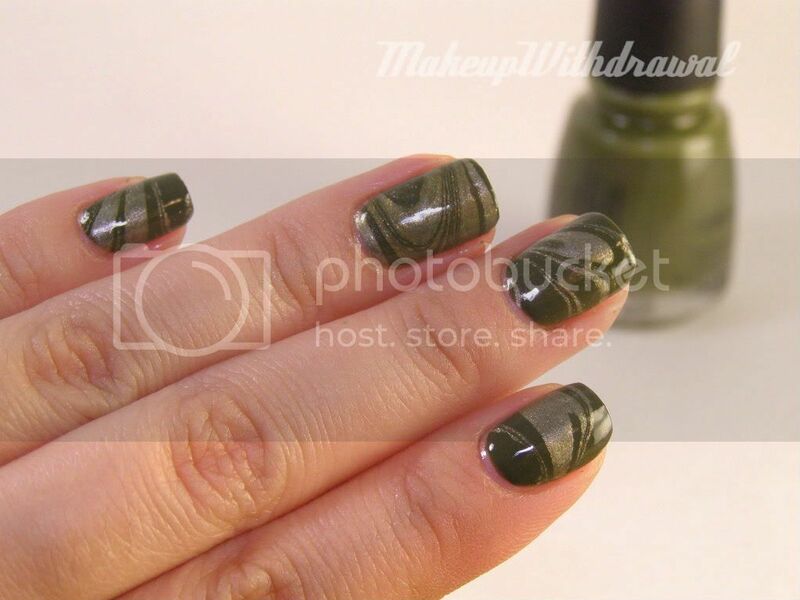 I thought long and hard about how to wear it, I love the color olive but I didn't want it to bee too camouflage/dusty, so I decided to water marble it. It was entirely by chance that Westside Warrior was right next to Brucci Meryl's Marital Bliss in my untried box, and I thought that it would make a great combination. Side note: Meryl's Marital Bliss? Really? Marital Bliss? That sounds like a pamphlet right out of the 50s or something. When I think of marriages, I think of hard work and communication. Not a gilded pewter pot of pre-made happiness. I guess if marriage was a polish, to me it would be extremely complex shade that looked different at every angle.